You can’t play softball without the right bat. But with all the different options out in the market today, how confident are you of choosing the best one? Having the best softball bat in your arsenal builds confidence at the plate, and puts a lot more zing in your hit. 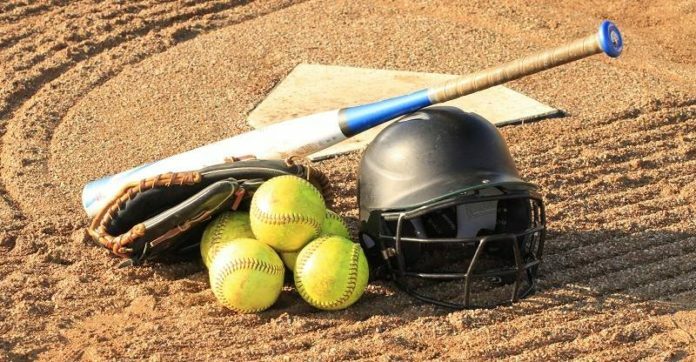 If this is your first time buying a softball bat, finding the right one can be a daunting process given the vast options on the market today. To ease the hassle of picking out the perfect bat, here are the top 10 softball bats of 2019. Finding the right softball bat isn’t as easy as walking to the store and picking the first one you see. You need to consider lots of factors such as the length of the bat you want, its ideal weight, and the materials used. Need to choose between a one-piece vs. two-piece bat? There are a few differences you need to take into consideration. One-piece bats are made out of a single, continuous piece of metal. Because of this, they are stiff and don’t offer much whip through the hitting zone, which makes one-piece bats more rigid. As a result, little or no energy is lost when the ball is hit, meaning players can generate more power from their hits. One-piece bats are the ideal bat for stronger players, e.g., power hitters. Two-piece bats, on the other hand, are constructed as two separate sections that are then fused together. These different pieces allow the bat to flex more through the hitting zone, providing the added boost in speed and power needed for contact hitters or newer players who are still learning. Before you buy your shiny new bat, check with your coach to ensure it’s compliant with your league’s regulations. The bat you buy must adhere to standards by at least one of the following associations: ASA, NSA, ISA or USSSA (it must also carry at least one of these league’s stamps on it to signify compliance). Here are a few methods you can use to find the right sized bat. Hold your arm straight out, and have someone measure the length between the tip of your index finger, all the way to the middle of your chest. The number you get will tell you where to look in the reference chart below. To check if the bat you have is the correct size, hold the bat handle and place the end cap on the floor while touching the handle with your palm, as shown on the video. If you can reach the handle without needing to stretch or bend your knees, then the bat is the correct size. Alternatively, as demonstrated in the video, place the bat at the center of your chest. If you can comfortably reach the end cap with your palm, then that bat is the right size for you. Remember, these are recommendations, not law. Finding the right sized bat ultimately boils down to factors such as personal preference, hitting style, and player strength. Test out different bat lengths and weights until you find the best one according to your style of play. This is a term you’ll hear being thrown around often. Drop weight is a number that is used to represent the difference between a bat’s length and its weight. It is calculated by taking the difference the weight of the bat (in oz) from its length (inches). Lighter bats have a higher drop weight, and heavier bats have a smaller drop weight. For instance, If you are shopping for a 34-inch bat that weighs 24 oz from our list of the best youth baseball bats. The difference between the bat’s length and its weight is 10oz. This kind of bat is commonly referred to as a drop 10 bat or a -10 bat. The drop weight for fastpitch softball bats ranges between -8 to -14. Knowing the drop of a bat helps you pick a weight that you are comfortable with, or in some cases, conform to league regulations as it is with high school and college leagues. Drop-weight regulations don’t apply in softball. Pick the most ideal bat weight for you! If your current swing speed is low, your bat is most likely too heavy. On the other hand, if your current swing speed feels a little too fast, it may be time to switch things up with a heavier bat. Test out different bat weights to find the ideal drop weight for you. Another thing to consider is the material your bat is made out of. Here are 3 types of bats you can buy. The material you pick is mostly down to personal preference. Some players like the feel of certain materials, while others like the sound. Each material has certain benefits and drawbacks. Read through each and make your pick depending on the material that best fits your needs. Composite bats are made from durable fibers of graphite or titanium mixed in with glass or kevlar. These are then woven together to create durable bats with lots of pop. Composite bats are lighter than other bats, which hitters love. Because they are lighter, composite bats have a lower swing weight which helps players generate higher bat speed, and offers them better control through the hitting zone. Composite bats need to be broken in before you can get the best out of them. This process typically takes 100-200 hits. Read our how to break in a composite bat guide here. Composite bats are more expensive than other bats due to the materials and the work that goes into making them. Aluminum bats have been around for years. One of the primary reasons they’ve been around so long is their durability. Many players have used the same bat for years. Aluminum bats cost less than composite bats do. High-end aluminum softball bats often cost less than their composite counterparts. Aluminum bats don’t require to be broken in, as they come “hot out of the wrapper” unlike composite bats. Are the preferred bat for power hitters because of their stiffer, solid feel. Are the preferred option for use in cold temperatures. They have less “pop” than composite bats. Have a smaller “sweet spot.” Because of this, getting consistently good contact with the ball is unlikely. Aluminum bats tend to sting the hands, on mishits. This can be remedied by using bat grip tape on the handle of your bat to dampen the sting. Bats are referred to as “hybrid” if they have an aluminum barrel and a composite handle. Hybrid bats combine the best of both worlds – lightweight composite materials and a durable alloy barrel to make for fantastic bats. For this reason, hybrid bats are often considered as the best softball bat you can buy. Hybrid bats have an aluminum barrel and a composite handle. Priced at about $200-$300, hybrid bats are quite pricey, but are often cheaper than full composite bats. Hybrid bats feel smoother on contact with the ball, and they sting the hands less than aluminum bats. This is because of the connective piece between the handle and barrel that works to absorb the vibration thus dampen sting. Like aluminum bats, hybrid bats come hot out of the wrapper and are a lot more durable than composite bats. 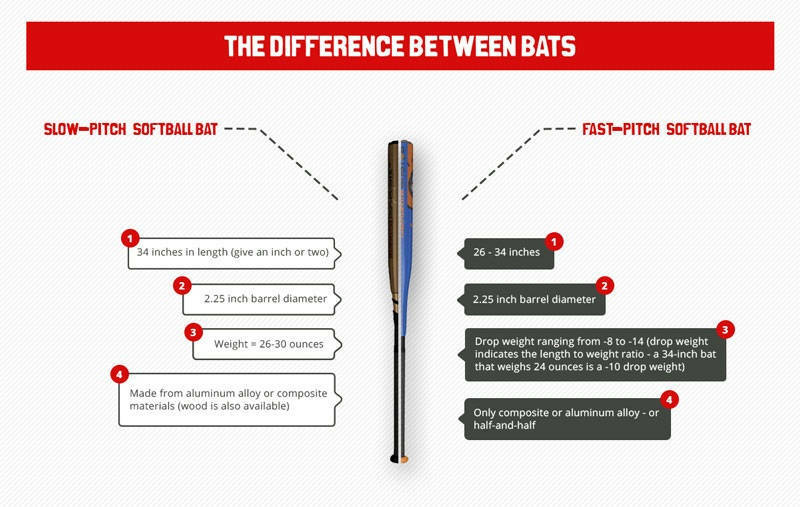 What’s the Difference Between Slow Pitch and Fastpitch Softball Bats? The rules around fastpitch and slow pitch bats require bats have a maximum length of 34 inches. However, the weight requirements are different. Fastpitch softball bats should have a maximum drop weight of 12 (or weigh 22oz max). Slow-pitch softball bats, on the other hand, are heavier, which helps players put more power behind their swing. That said, the weight of slow pitch bats should not exceed 38 ounces. Slowpitch softball is a lot more recreational while still maintaining a competitive edge. This makes it ideal for players of all levels. Read our buying guide to help you find the best slow pitch bat on the market today. On the other hand, fastpitch bats are manufactured for all women who play competitive softball. We have also written a comprehensive guide to finding the best fastpitch softball bat. Choosing the best softball bat can be challenging, especially if this is your first time. Not to mention that bats can get quite pricey, so it’s important to know exactly what you’re looking for in a bat so that you pick one that fits your style of play. Hopefully, this guide and our list of the top contenders set you on your way to finding the perfect softball bat.